From the window in Jessie Chung’s office, Hong Kong’s container port looks like a thriving hub of activity, funnelling Chinese products and other cargo to the rest of the world. 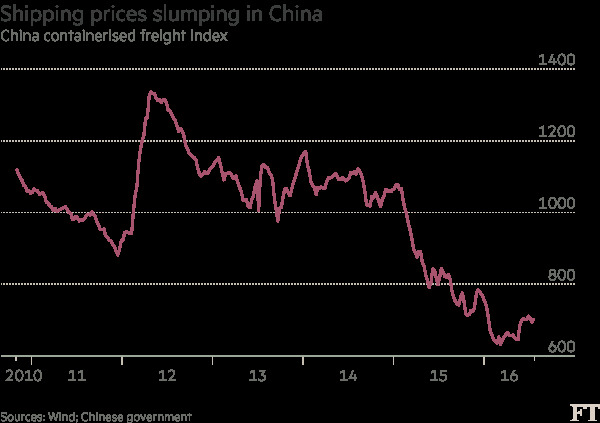 But Ms Chung, chairman of the container terminal operators’ association, concedes that the global slowdown, China’s shift away from low-cost manufacturing and increased competition from bigger Chinese ports are taking a heavy toll. In the first half of the year, Hong Kong handled 10 per cent fewer containers than during the same period in 2015 and is on course for its fifth consecutive year of declines. While crowded Hong Kong, where containers have to be stacked seven high, has its unique issues, it is also suffering because of overcapacity problems in ports and shipping amid a broad global trade slowdown. The bankruptcy of Hanjin, the South Korean shipping line, has focused attention on the woes of the shipping industry. 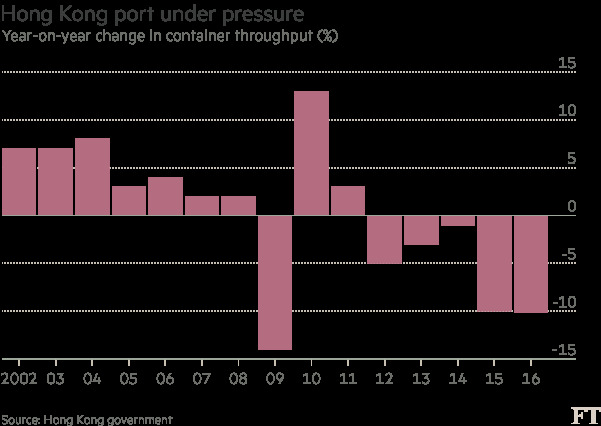 But ports in China, which has seven of the world’s 10 busiest container terminals, have also been hit hard by the global slowdown. As shipping lines consolidate to mitigate the downturn, analysts fear their increased bargaining power will add to the woes of the port operators. As with other state-backed heavy industries, China has a significant overcapacity problem. China’s excess port capacity in 2013 — equivalent to 50m 20-foot containers — was bigger than the entire throughput of Japan, Russia, South Korea and Taiwan. And the unused port capacity will double by 2030, according to the ITF, as local governments compete to build larger and larger facilities. At the same time, shipments from the world’s largest exporter are expected to remain under pressure because of the weak economic environment and China’s structural shift to advanced manufacturing. The government is investing billions of dollars to help factories make more valuable high-technology products such as smartphones and computer chips, which will take up less space in ships than furniture and shoes. China’s container exports fell by 7 per cent year-on-year during the first five months of the year, underlining this trend. Osbert Tang, who analyses Chinese ports for Moody’s, the credit rating agency, says that “it’s quite difficult to see volume growth bouncing back to the 15-20 per cent levels in the years after China joined the World Trade Organisation in 2001”. In addition, he says that the pricing power of Chinese ports is being squeezed because of the slump in profits at shipping lines, which are suffering from a sustained oversupply of ultra-large vessels. Robbert Van Trooijen, the Asia-Pacific chief executive of Maersk Line, the world’s largest container shipping group, argues that the latter problem should be alleviated by the “unprecedented consolidation” in the industry, which has seen a number of mergers and alliances, as well as the collapse of Hanjin. Peter Levesque, the chief operating office of Modern Terminals, which operates container ports in Hong Kong, Shanghai and Shenzhen, argues that this process should ultimately help his industry. Freight rates, which have slumped to near record lows amid the downturn, have rebounded a little because of Hanjin’s problems, with dozens of its vessels stranded at sea, holding billions of dollars of cargo. But Patrick Berglund, the chief executive of Xeneta, a price comparison website for container freight, says that the relief is likely to be shortlived, with someone ultimately acquiring Hanjin or its vessels. “Then you will have the same overcapacity issue in the industry still,” he says. In shipping and ports, Mr Merck sees systemic problems emanating from Beijing’s economic development model, which relied on state investments in heavy industry. “Overcapacity in shipping is related to overcapacity in shipyards, a lot of which is in China and is made worse by state support,” he adds.